Weeks ago, I discovered a sizable collection of antique books at a garage sale for $10. Included in that lot was a 20-volume ClearType Edition collection of Charles Dickens stories originally published in 1868. Generally regarded as the greatest novelist of the Victorian period, Charles Dickens was an English writer and social critic who created some of the world’s most well-known fictional characters. So this was one of my most compelling garage sale discoveries to date. 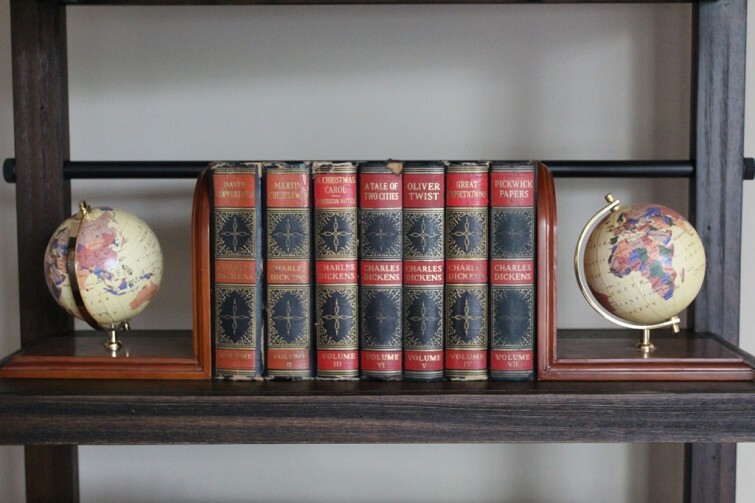 After I brought it home, I decided to do some research on how to store antique books, so that I could keep them safe until I had a home where I could properly display them. Dickens sprang to fame with the 1836 serial publication of The Pickwick Papers, which are featured in volume VII of this collection. Within a few years he had become an international literary celebrity, famous for his humour, satire, and keen observation of character and society. His novels, most published in monthly or weekly installments, pioneered the serial publication of narrative fiction, which became the dominant Victorian mode for novel publication. Above, I featured seven of his more recognizable novels out of the 20. As you can see, the condition of each volume varies greatly. This 20-volume set includes some of his best-known classics such as A Christmas Carol, Great Expectations and A Tale of Two Cities. 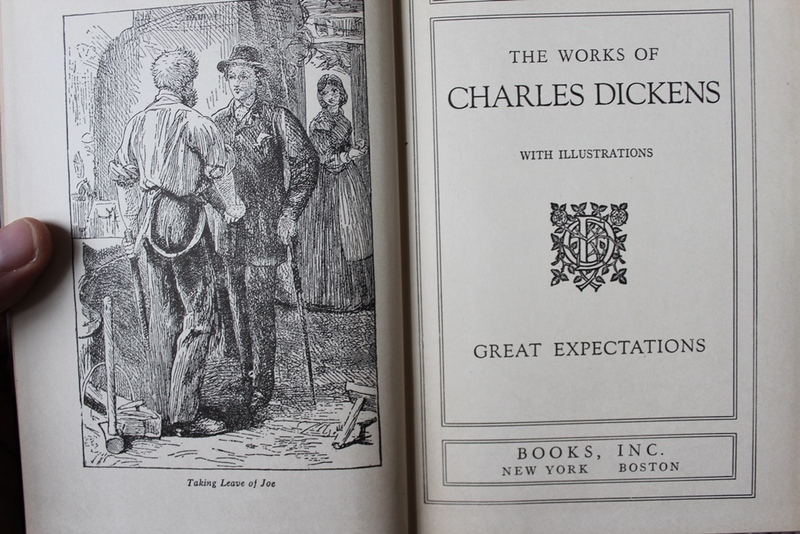 Many of the stories in this collection include some remarkable crosshatching illustrations, depicting important scenes for Dickens’ narratives (see the picture below). Released in 1843, A Christmas Carol is a novella that tells the story of bitter old miser Ebenezer Scrooge and his transformation resulting from supernatural visits by Jacob Marley and the Ghosts of Christmases Past, Present and Yet to Come. Dickens’ sources for the tale appear to be many and varied, but are, principally, the humiliating experiences of his childhood, his sympathy for the poor, and various Christmas stories and fairy tales. His thirteen novel, Great Expectations is a coming-of-age novel depicting the growth and personal development of an orphan named Pip. This along with his previous work David Copperfield trace the psychological and moral development of a young boy to maturity, his transition from a rural environment to the London metropolis, the vicissitudes of his emotional development and the exhibition of his hopes and youthful dreams and their metamorphosis, through a rich and complex first person narrative. Published in 1859, A Tale of Two Cities is a novel set in London and Paris before and during the French Revolution. The novel depicts the plight of the French peasantry demoralised by the French aristocracy in the years leading up to the revolution, the corresponding brutality demonstrated by the revolutionaries toward the former aristocrats in the early years of the revolution, and many unflattering social parallels with life in London during the same time period. If you’re interested in learning more about the historical and cultural impact of Charles Dickens, check out Becoming Dickens: The Invention of a Novelist, which examines a remarkable double transformation: in reinventing himself Dickens reinvented the form of the novel. I’d be interested to hear about the quality of this set, how readable and enjoyable they are, and particularly whether the type is tiny as it is in many old Dickens collections! Hi FloralSymphony. Thanks so much for reading and commenting! Fortunately, this set did not contain the typically small font type as some of its peers. As you can see from the featured photo, the condition of the set was remarkable. But the more popular books such as A Christmas Carol show much more wear. The stories have also aged really well in terms of relevance.